All the flavors of zucchini bread in tender pancake form. Heat a large skillet or griddle to medium and grease with a bit of coconut oil. Drain the can of crushed pineapple, being sure to reserve the liquid. Whisk the dry ingredients together. Toss the zucchinni and pineapple in the dry ingredients (this will keep them evenly distributed throughout the pancakes.) Set aside. Ladle batter by 1/4 cup onto greased skillet. Cook about 4 minutes per side or until bubbles begin to form on the surface. Flip and cook for an additional 2-3 minutes. 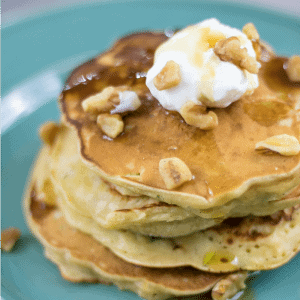 Serve with a dollop of plain Greek yogurt, maple syrup, and toasted walnuts. I love to use whole wheat flour for added nutrients, but all-purpose flour works as well. I love to use almond milk in these pancakes, but coconut milk, cow milk or even soy milk work great. Drain the crushed pineapple into a bowl or glass measuring cup and use the reserved pineapple juice in the pancakes. If you don't have quite 1/2 cup liquid, just use additional milk. I used coconut oil in the pancakes, but canola oil or melted butter works as well. If you happen to have leftovers, you can freeze for future use. Just lay out the pancakes in one layer on a cookie sheet and freeze for 30 minutes. Then remove and and place in freezer safe bag or container. Then pop one or more out of the bag at a time and reheat for 2 minutes and serve.